This stunning 3 bed, 3 terraced villa is situated on the front elevation of the complex. 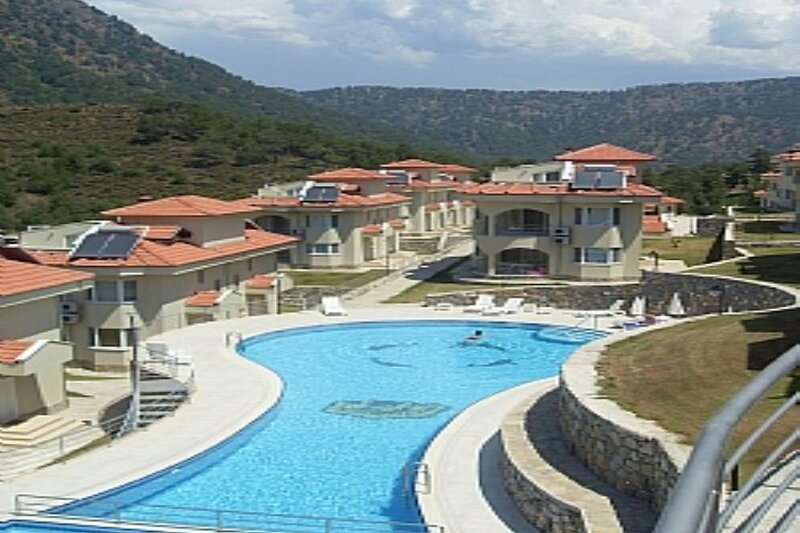 It has 2 large free form swimming pools both 120 sqm in size. The villa has excellent easy access to the first pool without walking any distance. The terraces of this villa are not overlooked by any other guest around the pool area. The morning sun rises behind the villa over the pool. and sets over the lake in front of the villa. All terraces are in partial sun all of the Spring/Summer season enabling you to get some sun or shade on the 3 terraces if you so desire. Bedroom 2 - Double bed/terrace access and air-conditioning. Bedroom 3 - Twin room/en-suite/terrace access and air-conditioning. Hair-dryer & Straighteners. All the 3 terraces have quality chairs and tables - the ground floor terrace has access from the kitchen and the lounge. The first floor terrace has access from both bedrooms, the top floor has its own private terrace. Fly screens are on all doors, and windows. The living area boasts an open fire place, 26" flat screen Satellite TV, The furniture includes 2 sofas, tub chair, coffee table and foot stool. Ipod/MP3 Docking station. There are 2 communal pools, private to lakeside visitors. The first pool is directly out side the entrance door of this villa, access is by steps. There are communal sun loungers, There are 2 umbrellas and sun lounger cushions for your use. The pools are not heated. Please bring your own beach towels. There is no restriction on when you can swim. The pools and grounds are lit at night and you may swim when ever you wish. There are many beaches local to Dalaman. Sarigerme, a long stretch of golden sand this beach has good facilities as well as a life guard. Iztuzu beach is famous for the nesting of turtles and is accessible from Dalyan via the boat taxi. It is also accessable by car. Dalaman for local food shopping and restaurants is 15 mins by car. Dalyan for shopping, boat taxi, beach, restaurants, ancient tombs and mud baths 40 mins by car. Gocek for an up market visit, harbour, shopping, restaurants, market, also 40 mins by car. Oludeniz 1.5 hrs drive from the villa. Lakeside villa has 24 hour security. Private parking outside the villa Ipod/MP3 Docking station.